The best way for animals to become invisible in the snow is to have white fur or plumage. Some mammals and birds in northern regions turn white during the winter as camouflage, molting back to brown-gray tones in summer to blend in with vegetation. This helps prey animals like hares, jackrabbits, lemmings and ptarmigans to hide and not get eaten, and it enables predators like arctic foxes and weasels to creep up on their prey. The species of hares that live in the arctic tundra and boreal forests of North America and Eurasia such as arctic hares (Lepus arcticus), Alaskan hares (Lepus othus), mountain hares (Lepus timidus) and snowshoe hares (Lepus americanus) are brownish-gray in summer and white in the winter. Some hares have other winter adaptations, like the snowshoe hares' large hind feet covered in thick long hair to help them move easily over deep snow. White-tailed jackrabbits (Lepus townsendii) inhabit grasslands and forested areas across west-central Canada and the United States. The jackrabbits' yellowish to gray-brown summer coats turn white in winter in the northern areas with significant snowfall, while only the sides of jackrabbits' bodies turn white in southern areas. Collard lemmings (Dicrostonyx groenlandicus) are vole-like creatures with long, dense coats. They inhabit the tundra, living, feeding and nesting in tunnels created in the snow, where they hide from predators like arctic foxes. In summer, their coats are gray to reddish brown and in winter they are pure white -- the only rodents whose fur turns white. At the same time two claws on the lemmings' forefeet grow larger to help them dig in the snow. Ptarmigans, including rock ptarmigan (Lagopus muta), willow ptarmigan (Lagopus lagopus) and white-tailed ptarmigan (Lagopus leucura), are adapted to living in the tundra with white winter plumage as camouflage in the snow. Ptarmigans also have feathered feet, which may act as insulation and help them walk over soft snow. Male rock ptarmigans shed their white plumage later than females during the breeding season as it's part of their courtship display, but when the snow has gone, this makes them vulnerable to predators like gyrfalcons. Arctic foxes (Alopex lagopus) are hardy creatures that are well-adapted to survive temperatures down to minus 58 degrees Fahrenheit. Their white winter fur -- sometimes blue-gray -- helps them go undetected as they hunt for voles and lemmings, and to hide from predators like polar bears. The foxes follow polar bears, scavenging on scraps from the bears' kills. 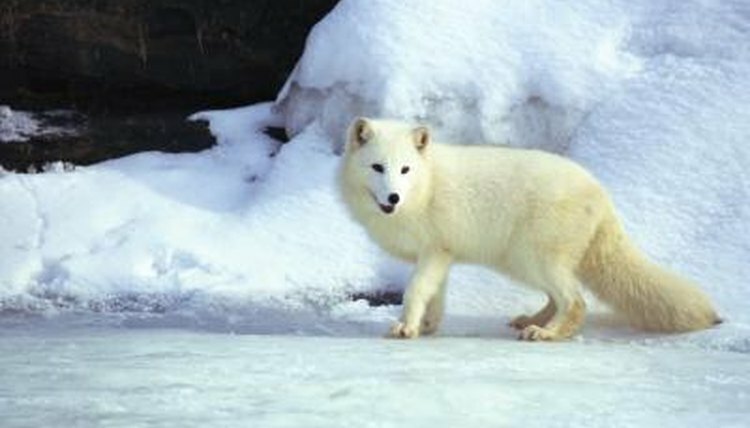 Some arctic foxes in the far north, where there is snow cover in summer, are white all year. Ermines (Mustela erminea), are members of the weasel family. They feed mainly on small mammals and can be found in the temperate north of Eurasia and North America. Their long bodies, with short legs, are chocolate brown on top and yellowish white below in summer, turning all white in the winter except for black tail tips. When ermines are chased across the snow, their predators may be focused on the black tips and strike the ermines' tails instead of their bodies. The larger long-tailed weasels (Mustela frenata), found throughout North and Central America, also turn white in the the winter in their northern ranges, but in southern areas they remain brown throughout the year.